Voyager 1 Takes Our First Steps To the Stars. Or Has It? This incredible story officially began in April 1977, when NASA dispatched the first of two probes—known as Voyager 1 and Voyager 2, respectively—to explore the outer gas giants. Once those objectives were reached, things took a much more ambitious turn: and in 1986, the Voyager Interstellar Mission was born. After 35 years in space—while virtually the entire planet was transfixed on the Curiosity Rover—NASA’s Voyager 1 probe finally reached its ultimate goal: taking humanity’s first steps into interstellar space. But because the farthest reaches of the Sun are an unknown frontier, researchers differ on just when—even whether—Voyager 1 actually broke free. The terminal shock: the point where the solar winds that maintain the heliosphere give way to the interstellar winds beyond. The heliosheath: the outermost boundary of the heliosphere. Beyond the heliosheath, they would embark on a journey among the stars. Think of the heliosphere as a “bubble” created by the Sun’s magnetic field; It protects our solar system from the pressures of interstellar space. Extending beyond the known planets and the Oort Cloud, it becomes attenuated and finally comes to an end in a series of zones leading to the heliopause: where solar winds cease to blow. The first of these is termination shock, which is a place where highly charged plasma from the Sun streams outward at a million miles per hour, before slowing down to subsonic speeds against the effects of the interstellar winds. Beyond it lies the transition zones of the heliosheath, where shifts in the flow of charged particles and magnetic fields signal that the interstellar winds prevail. Both probes are expected to send back data about the nature of the heliosphere and what happens at its outer edges. The problem, of course, is the unknown. Lack of concrete information makes it difficult for scientists to determine whether Voyager has actually crossed the threshold. For instance, no one knows how thick the heliosheath is, or how long it would take to cross it, though estimates suggested Voyager would need to travel 10 years or so. 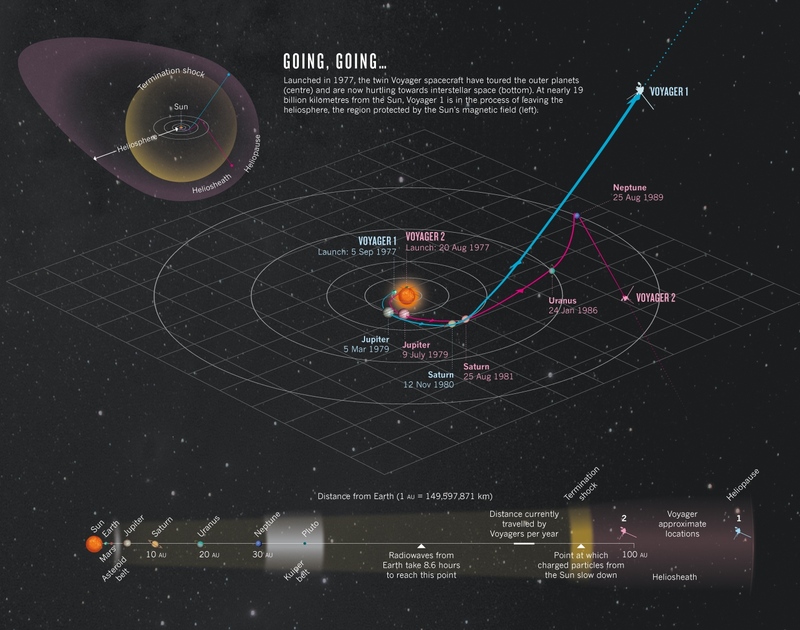 To that end, data sent back to Earth indicates that Voyager 1 entered the heliosphere in 2004, followed by Voyager 2 in 2007. What’s more, researchers must rely on models to predict what happens when solar and interstellar winds meet, and what signals would indicate Voyager crossed that boundary. But data from the craft itself has yet to confirm that those models are even correct, which drives the debate over whether Voyager 1 has already achieved interstellar flight. Has Voyager Reached the Stars? Based on computer models of what should happen in the heliosheath, mission researchers expected to see dramatic shifts in the flow and intensity of charged particles and magnetic fields, signaling the strengthening interstellar wind. But Voyager recorded less dramatic shifts and changes in the Sun’s magnetic field than expected, making it more difficult to confirm the craft’s passage out of the Solar System. In 2011, the American Geophysical Union announced that Voyager was about to exit the solar system; NASA, on the other hand, wasn’t convinced. They subsequently announced that the craft was still working its way though the heliosheath. Researchers were at an impasse, until finally, a major breakthrough helped pinpoint Voyager’s location. In March 2012, the Sun unleashed a powerful flare that didn’t reach Voyager 1 until April 2013. When it did, Voyager 1 recorded unusual vibrations in the solar plasma—believed to be the “sound” of interstellar space, which indeed confirmed that the spacecraft exited stage left. Scientists from the University of New Hampshire and colleagues answer the question of why NASA’s Voyager 1, when it became the first probe to enter interstellar space in mid-2012, observed a magnetic field that was inconsistent with that derived from other spacecraft observations, in a study published today in the Astrophysical Journal Letters. 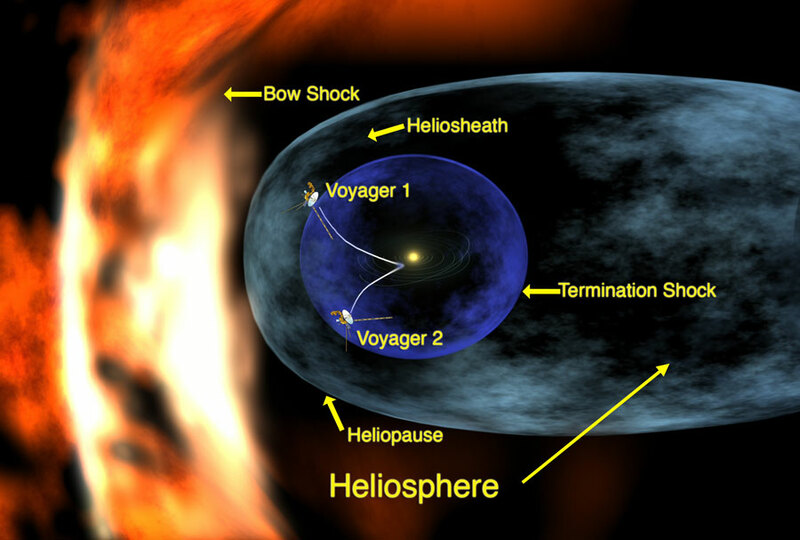 Voyager 1 sent back several different indications that it had punched through the edge of our sun’s massive protective bubble inflated by solar wind—the heliosphere—after a 35-year journey. But the magnetic field data gathered by the spacecraft was not what scientists had expected to see. The UNH-led study resolves the inconsistencies. “There are still naysayers out there regarding Voyager 1 crossing through the heliopause—the edge of the heliosphere,” says astrophysicist Nathan Schwadron of the UNH Institute for the Study of Earth, Oceans, and Space and department of physics and lead author of the paper. “And the reason for this doubt is that when the spacecraft supposedly broke through the heliopause we should have seen some sort of distinctive shift in the magnetic field from one medium to the other,” Schwadron says. The study shows that the initial direction of the magnetic field observed by Voyager 1 is deflected by the heliopause, like an elastic cord wrapped around a beach ball. Therefore, the spacecraft is moving through a special region of space where magnetic fields are rotated away from true magnetic north. This means that while Voyager 1 did cross the heliopause in 2012, it is still traveling through this “muddied” magnetic field region and won’t reach the “pristine” region of interstellar space until at least 2025. By the fall of 2015, Voyager 1 was about 125 billion miles (19 billion km) from Earth, with Voyager 2 lagging about 3 billion km behind. Both probes will have power until 2025, so Earth-based researchers will continue collecting data on the interstellar medium and other mysteries of deep space. After that, these intrepid probes will endlessly march onward through space, forever alone, but never forgotten.